This is a salad. That is correct. Sure, it gets drizzled with truffle oil, sprinkled with strong cheese and topped with fried shallots… but! Technically, salad. I mean, there are vegetables in this thing and you eat it with a fork. So, salad! Perfectly acceptable for consumption in this austere month of January. Don’t you agree? Don’t tell my mother, but I almost ripped out the battery from my smoke alarm making this salad. The thing is exceptional, in that if I accidentally breath on it wrong, it beeps uncontrollably. Beep! Beep! Beeeeeeep! 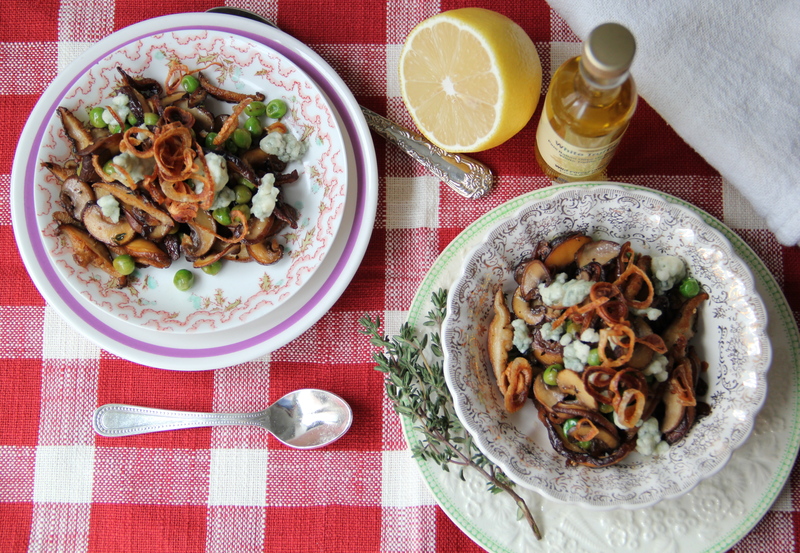 It loved the “sautée the mushrooms in batches” step of this recipe. Loved it. BEEP BEEEEEEP! But you know. All’s well that ends well, some people say. And I think I may have mentioned that this ends with truffle oil and crispy shallots. So, yes. Ends well. Coat a large sauté pan with 1/4 inch olive oil and heat over medium high heat. Drop the shallots in the oil (in a single layer) and fry until golden brown. Use a slotted spoon to remove the fried shallots from the oil and place them on a paper towel-lined plate. Set aside. Pour all but a thin layer of oil out of the pan, and place back over medium high heat. Working in batches, sautée the mushrooms with some salt, pepper and thyme, until all of the mushrooms are golden and cooked through. If the pan gets very dry, just add a bit more oil. It’s important to work in batches here, because you don’t want to crowd the mushrooms in the pan — they should lie in a single layer, so they brown beautifully (if you crowd them, they’ll steam and get soggy, without the yummy brown crispiness). As each batch browns, remove them to a large bowl. While the last batch of mushrooms is browning, throw the peas into the pan and cook for 1 minute, until thawed but still bright green. Add the lemon juice, stir, and remove the pan from the heat. 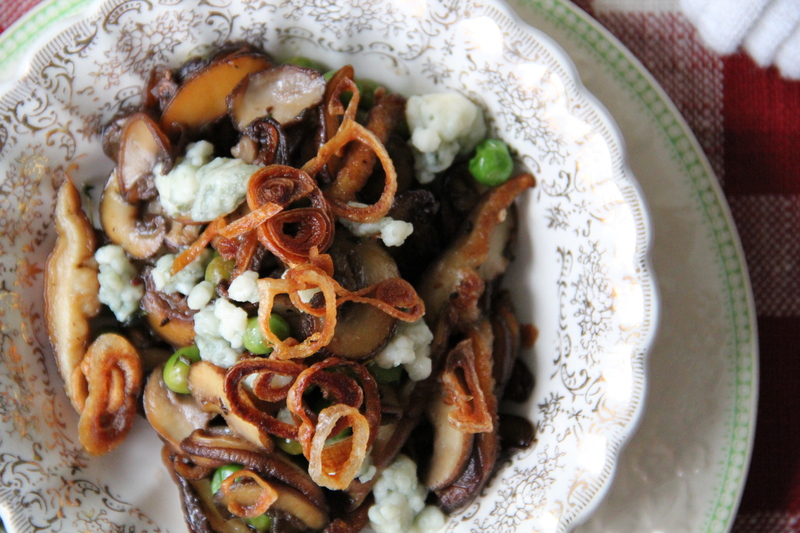 Transfer the mushrooms and peas to your large bowl. Drizzle the truffle oil atop the warm mushrooms, and stir to combine. 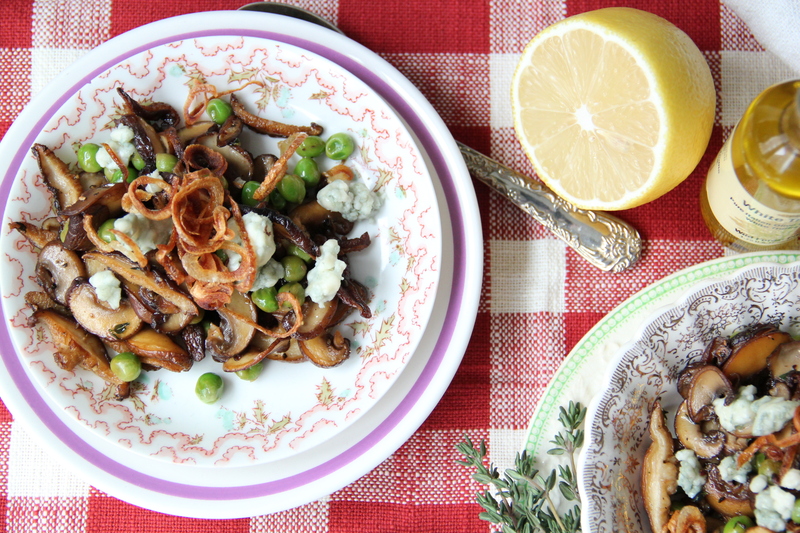 Sprinkle gorgonzola and fried shallots on top, and serve immediately. Makes roughly 2 cups mushroom salad (serves 2). Oh wow. This is totally a salad, and it is totally worth setting off the fire alarm for it. And I promise not to tell your mother. good question! I used black, but I bet white would be equally delicious.